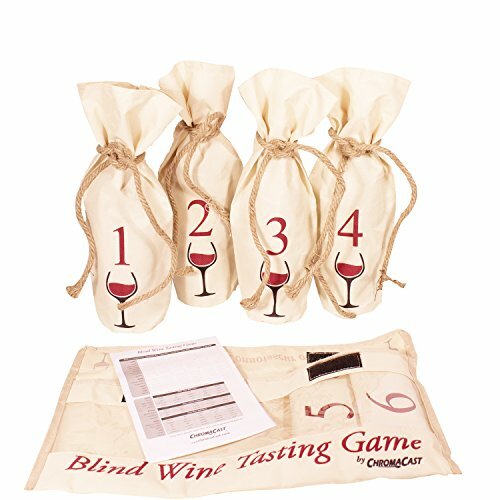 Blind Wine Tasting Game Includes: Six Individually Numbered Bags, Storage Pouch & Pad Of Scoring Notes - All you need is wine! by ChromaCast at Verve Wine Bar. MPN: WC-WBG. Hurry! Limited time offer. Offer valid only while supplies last. Blind Wine Tasting Game - Everything needed to conduct a blind tasting party. Educational and fun for everyone, from novice to sophisticated sippers. Blind Wine Tasting Game - Everything needed to conduct a blind tasting party. Educational and fun for everyone, from novice to sophisticated sippers. Includes: six individually numbered wine bags, storage pouch and a game pad of scoring notes (wine not included). Guess the color, aroma, taste, country, region, vintage, varietals and much much more. Try the hottest wine game on the market!!! Six individually numbered wine bags with sewn in rustic rope ties. Guess the color, aroma, taste, country, region, vintage, varietals and much much more. If you have any questions about this product by ChromaCast, contact us by completing and submitting the form below. If you are looking for a specif part number, please include it with your message.